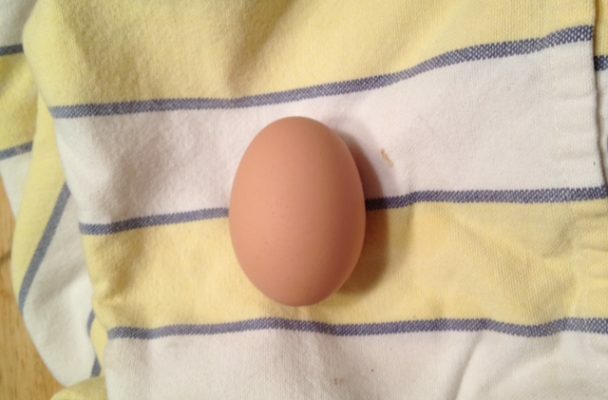 My First Egg… actually my hen’s first egg! Now that the roosters were gone it was just the “girls” and me and we settled into our daily routine. With no more danger of a rooster attack each time I entered the coop and no more seemingly violent chicken-whoopie happening I was relieved. My routine would go something like this. Each morning before work I would feed and water and then during good weather I would let the girls out into their outdoor enclosure. Then I would head off to work. Of course, the outdoor enclosure that I installed myself was a bit of a cob-job. I remember when I decided that I would need to install a larger outdoor enclosure. My decision came after giving my hens unsupervised and unrestrained free-ranging at all times and after I discovered that hens poop a lot and everywhere. Hens poop on the front lawn, on the sidewalk and on the front steps if allowed on the front steps. So it was with poop control and containment in mind that I headed back to the store to purchase fencing (Cha-Ching) and metal posts (Cha-Ching); and then a second trip would be needed for more fencing (Cha-Ching) and more metal posts (Cha-Ching). With supplies at the ready my work began to get that fencing installed and so it was that everyday after work and on the weekends for several weeks I attempted to pound posts into the “soil” around my house, soil that is really just rock and clay. In the end I did finish fencing a generous spot back under the trees but not without an elbow so inflamed, swollen and painful that I could barely lift my coffee cup each morning for months on end; and then adding insult to injury as soon as my outdoor-pen-under-tree-cover was complete one of the Black Australorps promptly flew over the darned thing to freedom. So much for controlling the poop factor… and so much for controlling a hen if she wants to fly. In the end I would keep my chickens contained in the coop and outdoor fenced area while I was at work and with the exception of that one hen who insisted on flying out from time-to-time they did stay pretty much contained. Once I was home from work the hens would be released to scratch, meander and poop wherever they liked. As for the chicken poop on my sidewalks and grass near the house and under the front yard shade tree, I posted a sign “Caution – Chicken Poop” and then at the end of each day I would scan the yard and hose down each pile of chicken poop absorbing it into the grass. Not the best plan in the world but one I could live with. 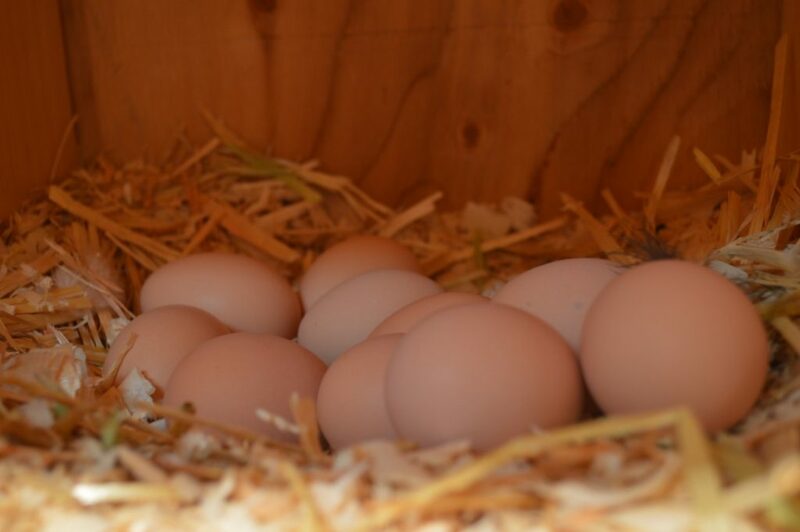 Of course, in the midst of all the construction, poop scooping and trips to Tractor Supply I went out one day to discover, in one of my homemade nesting boxes, one little brown egg. It was an exciting moment and I couldn’t be sure just who had done it, but I carefully brought that little egg inside and in the best kitchen lighting I snapped a picture… for posterity. My first egg had finally come after months of tending, building and poop patrol and over the next few days and weeks there would be a veritable flood of eggs. You see with 12 or so hens laying an egg every 24 hours or so I would end up with nearly a dozen eggs everyday! When the floodgate of eggs opened I found myself overrun with a refrigerator full of eggs. Even with my small network of friends and family I would at any given time have dozens of eggs in my frig. I remember thinking briefly … what have you done. I also remember a friend of mine after hearing I’d ordered some hens cautioning me, “It’s all about poop control” and so I ignored him. I also remember reading just a little about chicken egg production, I remembered horror stories about roosters and about raccoons getting into chicken coops, but in my chicken dream there was no poop, no predators, no problems… until there were.